Review in Art New England for the solo show at the Amy E. Tarrent Gallery, Burlington, Vermont, Nov-Jan 2008-09. 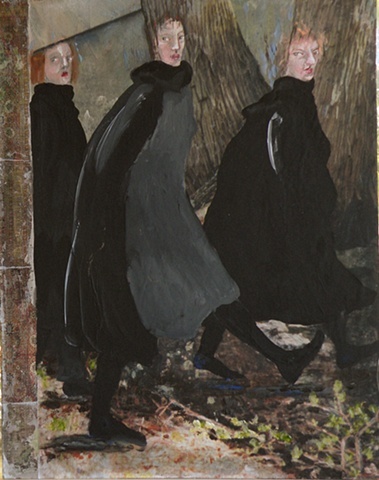 ".....In "Women on a Mission," three female figures outfitted in dark cloaks stride briskly through the woods, their simple geometry reminiscent of Bruegel's "Hunters in the Snow." Robinson... unveils an inventive body of work that's also unpretentious and playful." This painting is available for purchase. It can be found in the painting folder in the file titled "Unflattering Portraits."